Chocolate lovers have an array of tasty chocolate types to choose from. With so many to select, it may be difficult to understand exactly what the differences are or the best uses for each type of chocolate. The simplest and least processed form of chocolate, cacao is the bean part of the cacao removed from the shells. Each shell has dozens of beans in it. Cacao does have a chocolate flavor, but it is bitter. There is no sweetness because cacao has no sugar added. The beans have a crunchy, fibrous texture. Cacao beans are the whole beans of the plant, removed from the shell. They are about one inch in diameter. Cacao does have a chocolate flavor that is slightly bitter. It has a very light touch of sweetness, but there is no sugar added. You might use cacao beans in a nut or trail mix, but use them sparingly or the flavor may be overwhelming. Cacao nibs are peeled and crumbled pieces of cacao beans. They are small and have a bitter chocolate flavor and crunchy texture like the beans. People use them in trail mix, ice cream, or even in cookies. Cacao powder is made from ground and peeled cacao beans. You can use it in smoothies, shakes, and in baking in place of unsweetened cocoa powder. When fermented, roasted, and ground, cacao becomes chocolate liquor, which is the first form cacao takes in the processing of chocolate. Chocolate liquor tastes very similar to raw cacao, although the flavor is slightly more complex and toasty due to fermentation and roasting. Cocoa butter is the fat extracted from the cocoa bean. While chocolate fat probably sounds pretty tasty, it is actually fairly neutrally flavored like shortening. 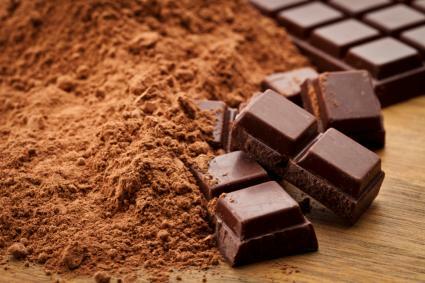 Cocoa butter is used in the making of other types of chocolate. Cocoa solids taste like cacao beans, only stronger, because the fat has been extracted. They form the base flavor for all types of chocolate and cocoa powders. Chocolate liquor is used in chocolate making. You may also be able to use it in place of unsweetened baking chocolate in recipes. It is bitter with no sweetness because there is no sugar added. You can find this type of chocolate on grocery store shelves in the baking aisle. It is chocolate liquor that has been poured into molds and allowed to harden. According to Better Homes & Gardens (BHG), unsweetened chocolate has the taste of chocolate without any sweetness. It is bitter with a fatty mouth feel that comes from the cocoa butter. It is the darkest form of chocolate because it has no milk or sweeteners added. Use unsweetened chocolate in baking. For example, you can melt it and combine it with sugar and other ingredients to make brownies, cookies, and cakes. It also makes a good base for mousses, puddings, and frostings. In sweet applications, you must use sugar with the unsweetened chocolate to help minimize the bitterness. Bittersweet chocolate is a form of dark chocolate that combines chocolate liquor and a small amount of sugar. It also has additional cocoa butter added for smoothness. BHG states bittersweet chocolate is at least 35 percent chocolate liquor. You may also find bittersweet chocolate referred to as semi-sweet chocolate and dark chocolate. If you find semi-sweet or bittersweet baking chocolate, it is sugar and chocolate liquor with no extra cocoa butter added. Bittersweet chocolate is exactly as it sounds. It has a nice, complex bitterness and deep chocolate flavor that is balanced by a mild sweetness. It has a creamy texture on the palate. Bittersweet chocolate has a number of uses. It is the chocolate chip recommended for making Toll House or chocolate chip cookies. It makes wonderful mousse because it is not too sweet. It is also excellent in truffles, ganache, candies, frosting, and baked goods. This is another form of dark chocolate made with more sugar, so it has a sweeter flavor. It only has 15 percent chocolate liquor, so the chocolate flavor is not nearly as intense as bittersweet chocolate. Many people wonder about the difference between this type of dark chocolate versus milk chocolate. While both are sweet, sweet chocolate is still a form of dark chocolate, while milk chocolate has the addition of milk or cream, which lightens the chocolate. Sweet chocolate still has a nice bitterness that you find in dark chocolate, but it is much sweeter than other forms of dark chocolate due to higher sugar content. It has a nice creamy mouth feel. Sweet chocolate is the primary chocolate used in dark chocolate candies and truffles. You can also use it in baked goods, although the result will be much sweeter than using semi-sweet chocolate. It is also good in mousses, ganache, and cookies. If you do use sweet chocolate instead of bittersweet chocolate, you may wish to adjust the sugar content to balance out the sweetness of the chocolate. Milk chocolate has 12 percent milk or cream, 10 percent chocolate liquor, cocoa butter, and sugar. It has a milky brown color that is lighter than dark chocolate. Milk chocolate has plenty of chocolate flavor, and it is quite sweet. The bitterness characteristic of dark chocolate is almost completely gone due to the addition of milk. It melts well and is creamy on the palate. Milk chocolate is one of the main chocolates used in candy bars. You can also use it in baking, making puddings, mousses, and frostings, or to make chocolate coatings and chocolate sauce. The name "white chocolate" is actually somewhat of a misnomer because it doesn't actually contain any chocolate liquor. Rather, white chocolate is made from cocoa butter, milk, and sugar. White chocolate is very sweet with a mild flavor. It is very creamy on the palate and melts well. White chocolate is used in baking, candy making, and dessert recipes. It is often used in nearly the same way as milk chocolate, and you can substitute white chocolate for milk chocolate in baking. Food.com says cocoa powder is dried chocolate liquor ground into a powder. While unsweetened cocoa powder for baking is typically unsweetened, you can also find cocoa powder and sugar that is sweetened. The most common use for this type of cocoa powder is making hot chocolate and similar beverages. Dutch processed cocoa powder is alkalized because cocoa is naturally acidic. You can use it for baking in any recipe that calls for cocoa powder. You can also use it to dust desserts as a garnish. Organic chocolate is made from cocoa beans and ingredients that have not been treated with any synthetic pesticides and fertilizers. It comes in all of the chocolate forms, and can help reduce your chemical load. It can also help protect the environment by minimize chemicals put into the soil. Organic chocolate will contain a label indicating it meets the standards for organics; for example, the USDA provides certification for food items that meet their organic standards. Chocolate labeled Fair Trade meets standards that allow farmers to receive a fair price for the cacao. Likewise, Fair Trade regulations prevent the use of child or slave labor in growing, harvesting, or processing the chocolate. Chocolate is a wonderful elixir. Whether you prefer milk chocolate or bittersweet dark chocolate, this versatile and delicious food always hits the spot.